Learn about the temperament and personality of the Miniature Poodle. Discover what he's like to live with, his traits and characteristics and how he generally behaves. And look at lots of Miniature Poodle photos. The Miniature Poodle is good-natured and eager-to-please. He's also cheerful, loyal, proud, dignified, and extremely smart. 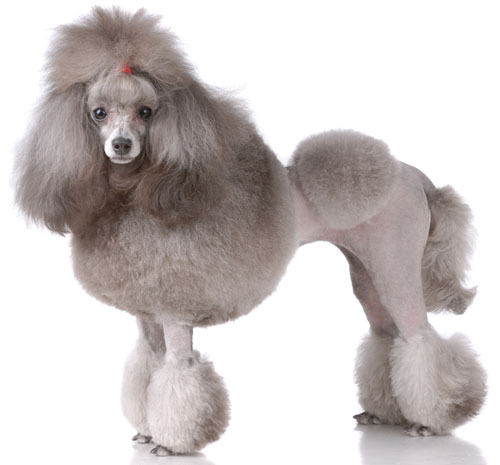 When most people think of a "Poodle" they think of a feminine, girly dog. But nothing could be further from than the truth. He's actually very rugged and athletic. He's incredibly intelligent -- one of the most intelligent breeds -- and is easily trained. He thinks of himself as a person and demands to be treated like one. He's very affectionate and craves your love and companionship. He wants to be with you always. He's highly playful and loves to clown around. He possesses a keen sense of humor! He's highly energetic and very active around the home. He's playful and can learn to play fetch! He's a strong swimmer and loves the water. He's highly social and loves all people. He's gentle and patient with children. He gets along well with other dogs and pets. If he's bored he will get into mischief, so you need to give him something to do to occupy his mind. He housetrains easily. He's one of the most popular breeds. The Miniature Poodle is the most intelligent and easiest to train of all dog breeds! He learns new commands quicker than any other breed, which makes him very easy to train. The Miniature Poodle sheds practically no hair at all. You'll virtually never find a hair in your home!